Nutritional disorder – magnesium (Mg) deficiency. Tobacco that is deficient in magnesium will initially develop symptoms on the lower or older foliage (Figure 1). These symptoms occur as an interveinal chlorosis that begins on the leaf margin, typically toward the leaf tip (Figure 2). Magnesium is mobile within plant tissues and will readily translocated from older leaves to the young developing tissues during limited magnesium conditions. As the symptoms of magnesium deficiency progress, the interveinal chlorosis will spread toward the center of the leaf (Figure 3). Additionally, as these symptoms worsen on the older leaves, the interveinal chlorosis will advance up the plant to the mid and upper foliage. Figure 5 shows advanced magnesium deficiency. It is important to note, interveinal chlorosis, may also be caused by an iron (Fe) deficiency. A pattern of interveinal chlorosis often develops under iron deficient conditions, but these symptoms first occur on the youngest or uppermost leaves. The location of the symptoms on the plant can be used to determine whether the plant is deficient in magnesium (lower foliage) or iron (upper foliage). The 360-degree image below shows the symptoms of interveinal chlorosis occurring primarily on the lower and central foliage (Figure 4). Figure 1. 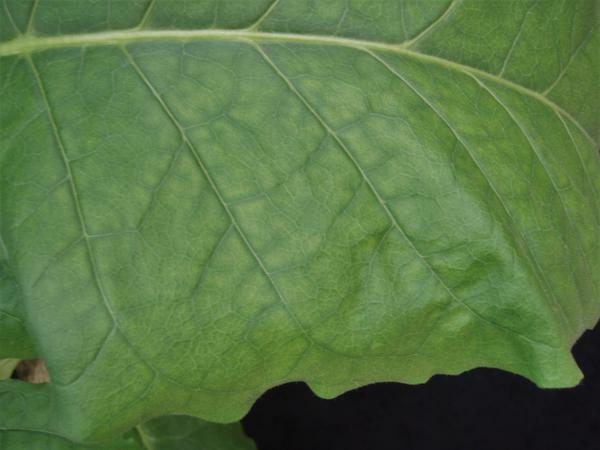 Symptoms of a marginal interveinal chlorosis begin on the lower leaves in Mg deficient tobacco. Figure 2. A closer view of a symptomatic leaf shows the pattern of chlorosis that begins on the margins, closer to the leaf tip. Figure 3. The pattern of interveinal chlorosis will eventually spread to the center of the leaf, as is seen here. Figure 4. The 360-degree view of this symptomatic Mg deficient tobacco may be viewed by clicking on the above picture. Figure 5. Advanced Mg deficiency. Potassium (K) deficiency also results in lower leaf symptoms, but in the case of limited potassium, the leaves have a more distinct marginal interveinal chlorosis pattern and necrotic spotting quickly appears, as compared to a magnesium deficiency. Tissue analysis for nutritional concentration can assist with a correct diagnosis. Similar to potassium and sulfur, magnesium is extremely leachable and is likely to be found in greater quantity deeper within the soil profile. Magnesium deficiencies are rare, but when found, are more likely to occur in soils types with deep, course A horizons. Plant growth will appear to be normal with a magnesium deficiency, as compared with stunted plants and leaf necrosis which occurs with a potassium deficiency. This distinction helps to differentiate potassium from magnesium deficiency. Submit a leaf sample for nutrient analysis. Burley. The magnesium sufficiency range for burley tobacco is similar for all growth stages (seedlings, early growth, flowering and maturity): 0.2 to 0.6%. The range is based on sampling the most recently mature leaves. Flue-Cured. The recommended ranges for flue-cured tobacco vary by the stage of development. The ranges based on the most recently mature leaves are: seedlings, early growth, flowering, and maturity are all at 0.2 to 0.6% magnesium. At harvest, sufficiency ranges for magnesium are at 0.2 to 0.6% magnesium (upper leaf and middle leaf), but varies slightly for the lower leaf (0.18 to 0.75%). There are no published recommendations for excessive magnesium levels, but excess magnesium is known to limit the ability of the plant to uptake potassium and calcium. In fields that have received a recent (within the past two to three growing seasons) application of dolomitic lime, magnesium should not be limiting. If soils are marked by extremely course texture and have greater than 15 inches to clay, Mg can be leached below the shallow rooting zone of the tobacco plant. In these conditions, 100-150 pounds of 0-0-22 should be sufficient when sidedressed at layby to address the loss of the nutrient. The same nutrient source can be applied broadcast-overtop after layby; however, it is likely that crop response will not be as rapid as when applied prior to layby. Seedling Production. Magnesium deficiency is extremely rare in the float system. If a deficiency is confirmed, four ounces of Epsom salts per 100 gallons of float water should be added to the bed. Field Production. The secondary nutrients of concern for tobacco are calcium (Ca), magnesium (Mg), and sulfur (S). These nutrients are called secondary because they are usually needed by most crops in smaller amounts than the primary nutrients. However, they must be available in adequate amounts for good yields and quality. If soil pH is kept within the desirable range of 5.8 to 6.2 with dolomitic limestone, the available levels of calcium and magnesium will usually be high enough to meet the needs of the crop. Otherwise, 40 to 50 pounds of calcium (Ca) and 15 to 20 pounds of magnesium (Mg) per acre are needed from the N-P-K fertilizer. Even with proper liming, some magnesium deficiency may occur on deep, sandy soils (more than 15 inches to clay) under severe leaching conditions. In these instances, supplying 15 to 20 pounds of magnesium per acre in the fertilizer may be desirable in the second and third seasons after lime application. However, using N-P-K fertilizers containing calcium and magnesium will not substitute for using dolomitic lime if soil pH is too low. Be especially aware of low soil pH. The state’s latest soil test summaries show that just over 25 percent of the tobacco fields tested in the last several years have had a pH lower than 5.5, with piedmont soils generally being more acidic than those in the coastal plain. Josh Henry (NC State M.S. student in Horticultural Science), Paul Cockson (NC State B.S. student in Agroecology), Ingram McCall (Research Technician in Horticultural Science), Rhonda Conlon and Rob Ladd (Extension IT at NC State), Matthew Vann (Tobacco Extension Specialist, Dept. of Crop and Soil Sciences), and Brian Whipker (Professor of Floriculture and Plant Nutrition in Horticultural Science).